Healthy and nutritious are two of important points for producers and consumers of snacks. Various snacks, from the traditional ones to development products of foreign food, are popular in the market. Through the Student Creativity Program (PKM), four students of Bogor Agricultural University (IPB), Nabila Armelinda Kartini, Annisa Febrianty, Nopa Aris Iskandar, and Yusuf Laduni under the supervision of Dr. Wini Trilaksani made a healthy snack called Helbygum. Helbygum can be a dessert as well as snack. Nabila, as the team leader conducted a research entitled "Helbygum: Functional Exploration of Wisdom of Dessert Terestrial dan Marine Herbal Nusantara". "We created a typical Turkish snack combined with Indonesian spices with Indonesian Lokum branding. 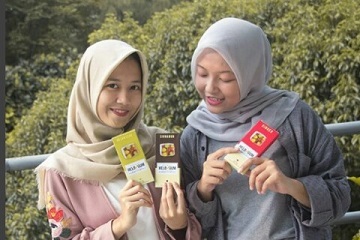 Helbygum is made from flour and sugar combined with Indonesian sweet herbs such as almonds, cashew, and peanuts"
Helbygum by IPB students has various flavors, which are kelor leaf, ginger, and cinnamon. Variant of the fillings are peanuts, dates, cashew, and almonds. Helbygum’s eye-catching package and various flavors attract diverse consumers. "We want to make dessert and snack with various flavors made from Indonesian spices which are healthy and affordable. Helbygum can be enjoyed by kids, teenagers, and adults. Helbygum is suitable for travelers, mountain climbers, workers, athletes and active young people, "said Nabila.